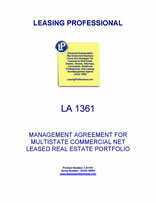 This management agreement is for the management of a portfolio of net leased commercial real estate properties spread across several states. The manager appointed in the agreement has detailed responsibilities, and will be compensated by receipt of a percentage of the "gross income" of the properties. This form is a management agreement for a portfolio of affordable hotels. 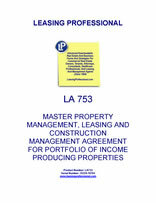 The agreement appoints the manager and details its management responsibilities for the properties. The agent is compensated monthly based upon a fixed percentage of gross revenues from the properties. There is no incentive compensation arrangement for the agent, but the agreement does contain an expansive definition of "gross revenues" upon which the agent's compensation is based.